Brazilian researchers may have discovered why Africanized honeybees are so aggressive. The scientists detected higher levels of certain chemical substances in the brains of Africanized honeybees than in gentler strains of honeybees bred by beekeepers. According to a study published in Journal of Proteome Research, the chemical substances in question may trigger irascible behavior by normally placid bees. The same compounds had been detected in the brains of flies and mice, where they appeared to regulate food intake and digestion. This evidence provides an example of how behavior evolves differently in different species via similar molecular mechanisms. The research was conducted by Professor Mario Sérgio Palma at the Center for Studies of Social Insects in São Paulo State University's Bioscience Institute (IB-UNESP), Rio Claro, Brazil. "We study the composition of proteins in the glandular systems of wasps, bees, ants, spiders and scorpions. We analyze the individual functions of each protein and its molecular interactions, as well as its molecular structures. That includes these animals' venoms, their chemical communication systems via chemical compounds, and the neurochemistry of the regulation of arthropod behavior via the nervous system," Palma said. The study set out to investigate the neurohormone production mechanism in the bee brain. Neurohormones are chemical compounds that regulate the nervous system and are involved in mediating the social behavior of these insects. The study relates to the identification, characterization and quantification of the proteins in animal systems. "We wanted to study the origin and metabolism of neuropeptide precursor proteins in the bee brain in order to understand how these hormones are produced," Palma said. "We also wanted to identify the brain regions responsible for the action of these compounds. To this end, we used matrix-assisted laser/desorption ionization (MALDI) combined with mass spectrometry imaging (MSI)." The technique consists of breaking down the atoms or molecules in a sample so that they become charged with more or fewer electrons than the original (ionization) and then separating them by mass/charge ratio in order to identify and quantify them. It can be used to identify chemical compounds inside tissue without requiring cellular extracts and to locate the brain regions in which hormones are active. "You can use it to investigate the chemical structure of neuropeptides and map the brain regions they affect," Palma explained. The experiments were performed at IB-UNESP's apiary. Combs containing larvae were incubated in the laboratory, and some 1,000 newly emerged workers were marked on the thorax using nontoxic paint. They were returned to the hive, and when the marked bees were 20 days old, the colony was subjected to what the researchers call an aggression or stinging assay. The bees, including marked individuals, were placed in an observation arena. A small black leather ball with a diameter of 5 cm was waved several times in front of them. "Various kinds of warning and attack behavior were observed and recorded by the researchers," Palma said. 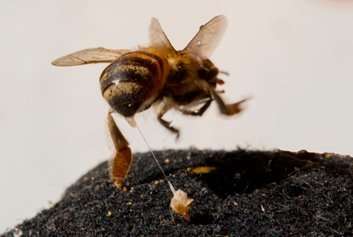 Some bees also stung the target and thus got stuck to the surface of the ball by their barbed lancets. Marked individuals were collected, immediately frozen in liquid nitrogen and dissected. Their brains were removed and cut into slices for proteomic analysis. Proteomics is a field of biotechnology that analyzes the entire protein complement of a cell, tissue or organism. Worker bees that remained in the hive during the attack were also collected for comparison with the aggressive individuals. Commenting on the comparison between the bees captured outside the hive and individuals who remained inside, Palma stressed that it was not a matter of location but of differences observed between worker bees that displayed the various kinds of alarm and aggressive behavior, especially stinging, and workers that did not become aggressive even when stimulated to do so. "The precursor proteins in the brains of the non-aggressive bees were found to be intact in their inactive form, meaning these substances didn't stimulate aggressive behavior," he said. On the other hand, only the mature forms of these proteins were found in the brains of the aggressive bees. They were small pieces of precursor proteins created by the action of enzymes known as proteases. These smaller pieces must undergo further chemical modification (proteolysis or cleavage) in order to become active neuropeptides, that is, hormones acting on the brain in order to adapt the organism according to some behavioral pattern—in this case, the bee's aggressive behavior. "The neuropeptides we identified can be found with minor structural differences in several insects, but until now, they have rarely been chemically and functionally characterized. In the aggressive bees analyzed, we concluded that the functions of these neuropeptides were to regulate the energy metabolism, activate vigilance and spatial coordination of flight, and stimulate the production of alarm pheromones." When the researchers observed that the neuropeptides stimulated aggressive behavior, they decided to synthesize these compounds in the laboratory and inject them into young worker bees, presumably too immature to perform aggressive roles in the colony. "The result was that these workers began displaying aggressive behavior only a short time after being injected with the neuropeptides. This included stinging the targets," said Palma, who is principal investigator for the FAPESP Thematic Project. The neuropeptide precursors are mature in the brains of adult workers, but in young workers, they have not yet been cleaved and cannot result in mature or active neuropeptides. By the time workers are between 15 and 20 days old, they have the molecular tools needed to catalyze precursor maturation. As a result, the neuropeptides in their brains are instantly activated in response to threatening physicochemical stimuli, and they begin to behave aggressively. "When we injected synthetic neuropeptides in their mature form into these young workers, they were endowed with mature neuropeptides, and in a few moments, these compounds activated metabolic and physiological transformations that enabled the bees to behave very aggressively," Palma said.